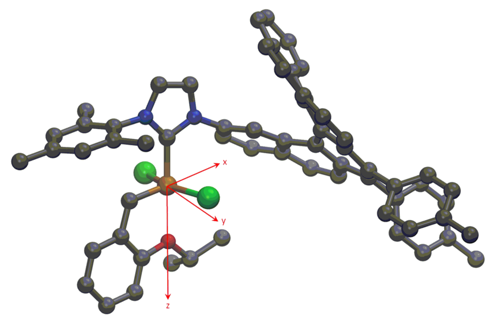 An enantiopure helicene serves as a chirality inducing element in a Grubbs-type transition metal-N-heterocyclic ruthenium carbene complex. This first helically chiral olefin metathesis catalyst was studied extensively by spectroscopic methods. A DFT-optimized structure was obtained, and based on these data the percent-buried-volume values and a topographic steric map were calculated. As a proof of concept, it was shown that the new enantiopure catalyst mediates an enantioselective RCM with moderate enantioselectivity. This work is the result of an international project with participating colleagues from Potsdam, Prague and Warsaw.